Always Trap Feral Kittens, Don't Chase 'Em Down and Bag 'Em! ← How Are You Celebrating I Love NYC Pets Month? Always Trap Feral Kittens, Don’t Chase ’Em Down and Bag ’Em! Chasing down feral kittens and grabbing them is always a bad idea, even when successful. The stress and anxiety for the kittens can take weeks for them to overcome. I imagine their instinct must convince the kittens that the person chasing them is set upon eating them. When that same person tries to pet them, and hold them, and nurture them, I’ll take that bet as to how receptive they will be. 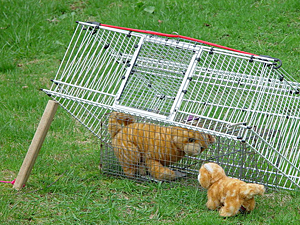 Trapping removes a human presence from the terrifying experience of being separated from their mother and the life they know. The human can then actually take a positive role when we offer food and reunite them with their siblings. The less the kittens associate humans with their trauma, the faster we can gain their trust and tame them for adoption. Before starting any trapping, I feed the mom and kittens for several days from a trap that I secure open with a cable-tie to make sure no one gets trapped before I’m ready. I put a big bowl of food in the back of the trap and a trail of food from front to back. The objective is to make sure that even the shyest kittens and mom are not afraid to go into the trap before you start trapping. Trust me, doing this will save you hours and days of trap-watching. If you can’t leave a trap out safely, try it even for the short time you are there feeding each day. Padlock the trap (secured open) to a fence if there is any risk of the trap being stolen or tampered with. Hide it under a bush if you can safely leave it for all the cats to get confident going into it without hesitation. Normally, moms trot out their litters to the feeding station at about six weeks old. If you saw when the mom got skinny (after delivering her litter), you can set up the trap (tied open) about six weeks later and start “training” mom to go into it even before she brings the kittens along too. Nursing moms are extremely hungry and sometimes, it is only when nursing that you can hope to trap a very wary female. You probably won’t see all the kittens the first day or two. There are usually a couple of very shy ones who won’t dare to follow mom the first day or two. Once mom and all the kittens have been seen going into the trap to eat without hesitation, only then are you ready to start the trapping project. I always try to trap mom first and get her safely out of the picture with no kitten witnesses. Moms usually leave the den in mid-afternoon to look for food while the litter is still sleeping. This is the perfect time to set the trap for her and whisk her away to a basement, garage, or bathtub for holding, after covering the trap with a sheet to keep her as calm as possible. Make sure your vet isn’t one of the less experienced ones who won’t spay a lactating female. Most vets experienced with ferals will do it without a problem. After six weeks, mom is ready to start weaning the kittens and she can be spayed safely after this point. If you prefer to spay her later, that’s fine, but in a large TNR project, sometimes you need to spay when you get the chance and not risk another litter. It’s your choice, time, and energy, but getting mom spayed should be a priority and not forgotten just because there are kittens to deal with. I trap mom in the conventional way, setting the trip plate, but with the kittens, I switch to the bottle and string technique shown in photo 1. This way I can be sure a second or third kitten is not in the way of the door or gets caught when the door comes down. You may even get lucky and get two or three kittens at a time as they crowd into the back of the trap around the dish of food. Get the shyest kittens first. Don’t be in a hurry and greedily trap the first and bravest kittens to go into the trap. Learn how many there are before you start trapping and keep track of which ones are the last to come to the party. Late afternoon near dusk is the usual time for kittens to leave the den and come to the feeding station where you’ve “trained” them to go into the trap without hesitation. The shy ones will “freak” if they witness the brave ones getting trapped. When you start to trap the kittens, let the brave ones eat and go if necessary to wait for the shy ones. You’ll always get another chance with the brave ones. The shy ones are the smart ones and they won’t give you a second chance for some time if you blow it the first time. They are used to mom being away for periods of time without worrying so don’t worry about that. Wait until the shyest one, or hopefully two, are in the trap eating together to pull the string for the first time. Even if a couple of the braver ones witness this, they’ll come back soon enough but not vice versa. The shyer/smarter ones will hightail it back to the den and not come out for a day or more if they witness the trapping of the braver ones, or if half their family mysteriously disappears. Get them first and you’ll be done with everyone in short order. Even if the brave ones have eaten and gone, they won’t hesitate to come back the next day and eagerly load into the trap. Don’t be in a hurry. Wait until you get the shy one(s) first, with no other shy witnesses, if at all possible. In that case, I put mom or another kitten sibling in a trap and put that trap inside a larger trap or under a drop trap. (A small cat or squirrel trap fits inside the bigger raccoon traps.) 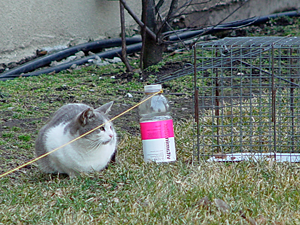 The kitten will often come out to see the mom and can be trapped in a regular trap using the bottle and string or with the drop trap. Six weeks old is OK to separate mom and kittens. 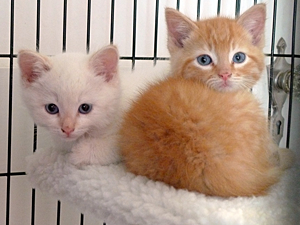 Start the kittens right away with socialization for adoption, and TNR mom and return her for continued outdoor care. Don’t forget to have her eartipped! For information about taming feral kittens, attend one of our upcoming workshops on taming feral kittens or look for information at NYCFeralCat.org.